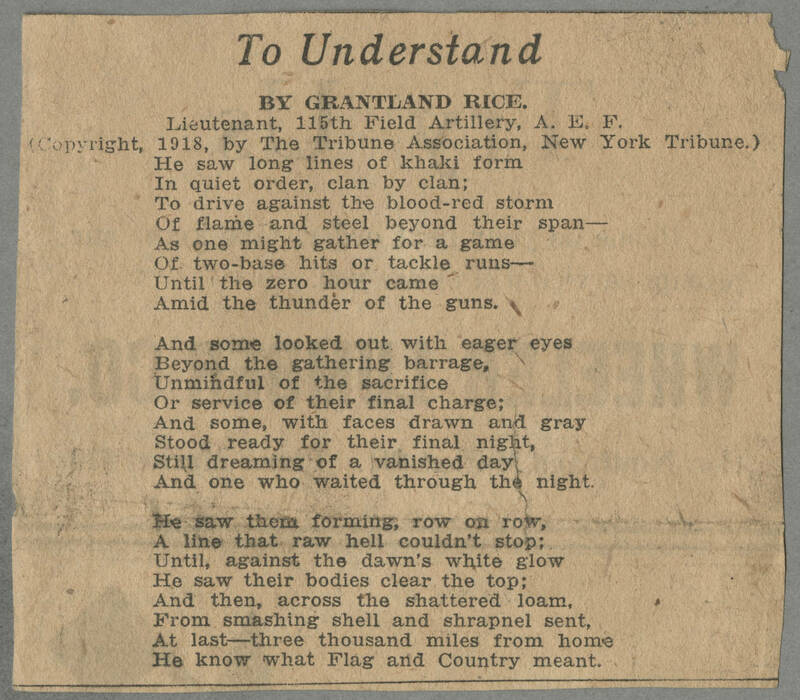 To Understand BY GRANTLAND RICE. Lieutenant, 115th Field Artillery, A. E. F. (Copyright, 1918, by The Tribune Association, New York Tribune.) He saw long lines of khaki form In quiet order, clan by clan; To drive against the blood-red storm Of flame and steel beyond their span - As one might gather for a game Of two-base hits or tackle runs - Until the zero hour came Amid the thunder of the guns. And some looked out with eager eyes Beyond the gathering barrage, Unmindful of the sacrifice Or service of their final charge; And some, with faces drawn and gray Stood ready for their final night, Still dreaming of a vanished day And one who waited through the night. He saw them forming, row on row, A line that raw hell couldn't stop; Until, against the dawn's white glow He saw their bodies clear the top; And then, across the shattered loam, From smashing shell and shrapnel sent, At last - three thousand miles from home He know what Flag and Country meant.